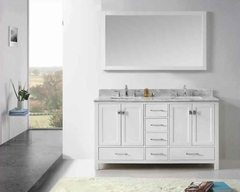 This modern vanity set belongs to the exquisite Prelude design series. It features a rectangle shape. This vanity set is designed to be installed as a floor mount vanity set. It is constructed with birch wood-veneer. 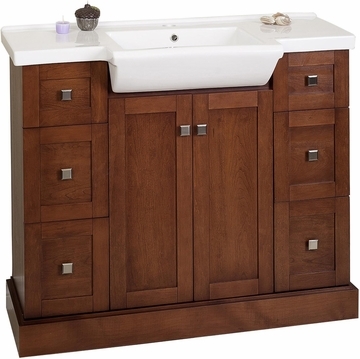 This vanity set comes with a lacquer-stain finish in Cherry color. It is designed for a 1 hole faucet. THIS PRODUCT INCLUDE(S): 1x vanity base in cherry color (51), 1x ceramic top in white color (118). A large cabinet with two soft-close doors with European style hinges. Includes adjustable floor levelers under the legs for uneven floors. Four large and two mid-sized full extension drawers with sturdy joints and soft-close slides. Crafted with american birch wood and veneer. No assembly required. White ceramic top for single hole faucet installation. Premium white glaze for a glossy finish with a kiln dried ceramic construction. Smooth non-porous surface; prevents from discoloration and fading. Faucet and accessories not included. Solid wood frame with no MDF or chipboard used. Quality control approved in Canada and re-inspected prior to shipping your order. Knock-out plumbing backboard for easy water supply and drain access. Includes cabinet hardware. Includes adjustable floor levelers under the legs for uneven floors. Machine cut and tapped for smooth chip-free edges. Multi-layer 7-step stain finish enhances the grains of natural wood and gives it a luxury look. Vanity is completely finished inside out including the back of vanity. Sink features an overflow. Fully adjustable in-out and up-down European style hinges are completely concealed when door is closed.